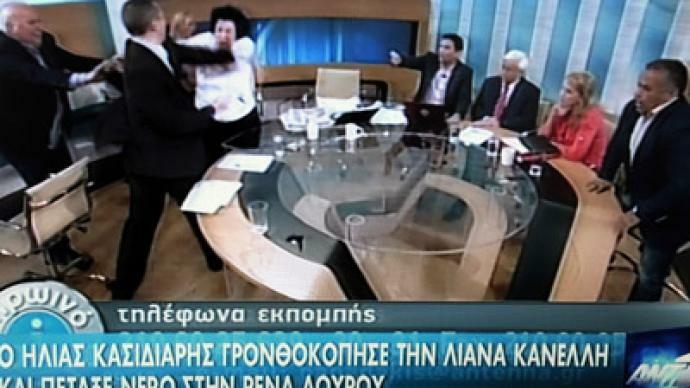 A series of vicious slaps and a glass of water to the face were unleashed on two left-wing female deputies by the spokesman for Greece’s neo-Nazi Golden Dawn party during a live TV debate. A warrant for the politician’s arrest has been issued. ­Golden Dawn spokesman Ilias Kasidiaris flew into a rage during a heated argument with radical left Syriza party member Rena Dourou on a morning TV talk show in Athens. Kasidiaris was already agitated after Dourou made reference to a criminal case pending against the far-right spokesman. Papadakis appeared in court on Monday for his alleged role in a 2007 armed robbery which saw a postgraduate student viciously stabbed. His trial was postponed for a week. 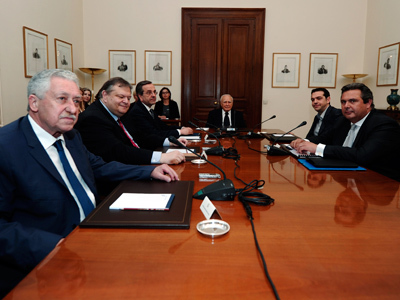 Kasidiaris finally snapped after Dourou, 58, animatedly expressed there was a "crisis of democracy when people who will take the country back 500 years have got into the Greek parliament." The 31-year-old Kasidiaris bound out of his seat and doused her with a glass of water from across the table, deriding her as a “a circus act.” Communist Party member Liana Kanelli stood up and swatted him with a piece of paper in protest, to which the brawny former Special Forces soldier unloaded on her with a three slap combo. Talk show host Giorgos Papadakis jumped into the melee, repeatedly shouting “No!” in a failed bid to restrain the enraged right winger deputy. The channel immediately cut to a commercial break. Afterwards a journalist from the TV station said they had tried to keep Kasidiaris from leaving the premises. Five minutes later when the cameras starting rolling again Kasidiaris had fled the scene. 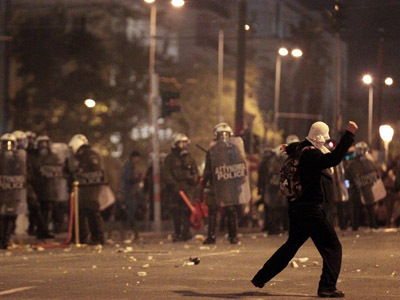 The Athens prosecutor immediately ordered police to hunt him down. 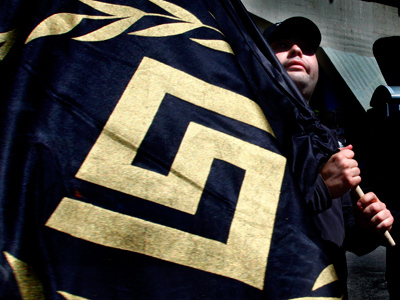 Golden Dawn refused to apologize for the incident, saying Kanelli had initiated the assault by "hitting him unprovoked in the face with a packet of documents." "Golden Dawn continues its fight for a strong nationalist movement against everyone, and naturally against the orphans of Marx, who dominate the (television) channels and are playing a dirty propaganda game," the party said in a statement. "If you want us to condemn our co-fighter for a truly unfortunate moment, you should first condemn the insults and the attack by Liana Kanelli, otherwise you are nothing but sad hypocrites following orders," the statement continued. However, the assault of a woman on national TV has united the country’s fractured political scene in condemnation of Kasidiaris’ actions. "The government condemns in the most categorical way the attack by Golden Dawn spokesman Ilias Kasidiaris against Liana Kanelli and Rena Dourou”, interim government spokesman Dimitris Tsiodras said. 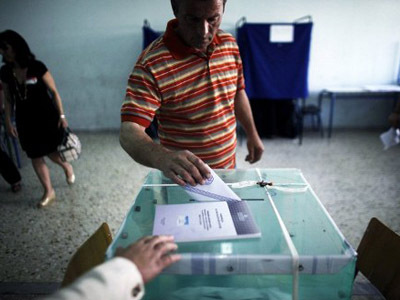 The fascist-leaning and one time fringe Golden Dawn party shocked many by picking up 21 seats in the 300 seat parliament – seven per cent of the vote – in Greek’s inconclusive May 7 parliamentary poll which has left the country without an effective government. Party leader Nikos Michaloliakos has denied the existence of gas chambers at Auschwitz and impugned the number of Jews killed in the Holocaust. He also suggested planting anti-personal mines along the countries border with Turkey to keep immigrants out. Party members have been linked to a string of violent anti-immigrant assaults. 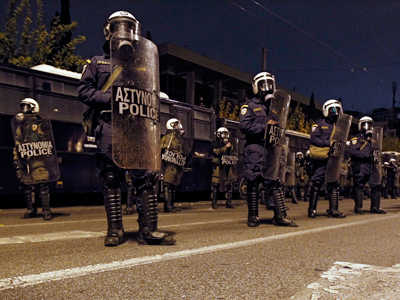 The Kasidiaris’ boiling-point battery is almost symbolic of the pressure cooker Greece has become in recent times. Europe is waiting in anticipation as a repeat election scheduled for ten days time could determine the future of the eurozone.